Yayoi Kusama (March 22, 1929, Matsumoto, Nagano Prefecture, Japan) — Japanese artist, writer and poetess, feminist, master of installation and performance. The most expensive of the living artists. 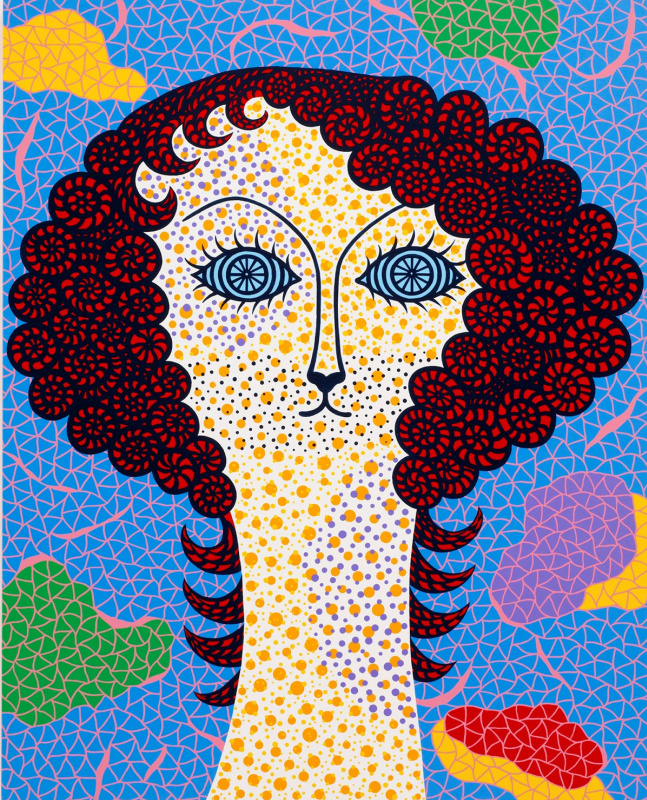 Features of the artist Yayoi Kusama: its famous "polka-dot" patterns have already become a brand — just like Yayoi who personifies him in a recognizable look: a bright wig, clothes made of fabrics with characteristic ornaments. Headlines about the artist rarely do without mentioning mental illness. Indeed, the peculiarities of the hallucinatory perception of the world caused by mental disorders formed the basis of Yayoi Kusama’s work. It is based on the idea of repeating patterns — "networks of infinity" and spaces covered with peas and phallic symbols transformed into some coral reefs. Overcoming fears through the multiplication of objects is the "recipe" for the artist’s personal art therapy. Yayoi Kusama calls herself "an obsessive artist" and invites viewers to experience her personal perception of reality, to see the world as she sees it. Yayoi Kusama was born into a rich provincial family professing the traditional values characteristic of Japanese culture. At the age of ten, Yayoi had the first attack of hallucinations — the girl was looking at a flower tablecloth, and at some point she thought that the flowers began to spread to all surfaces of objects in the room, windows and walls. This childish impression of dissolving into infinity will subsequently repeatedly become one of the principles on which Kusama creates his installations. One more fear of sexuality, which Kusama developed in her younger years under the influence of the complex relations between her parents, the artist will subsequently multiply and reflect this factor as a kind of symbolism. Despite the resistance of her conservative family, Yayoi persistently engaged in drawing, she studied classical Japanese painting nihonga. 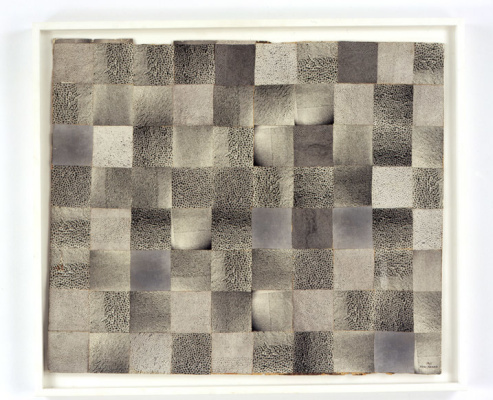 In the early 50s the exhibition career of the artist started. She painted a lot and passionately; At her first solo exhibition, more than 250 works were presented, including, in the genre of surrealism. On the recommendation of psychotherapists, Kusama begins to look for an opportunity to leave the family and leave Japan. As the artist later noted, by that time she began to consider Japanese society "too small, too slavish, too feudal, and too dismissive towards women." She writes to several famous artists, to whom she sends her watercolors, and receives an approving letter from Georgia O’Keefe. In 1957, Yayoi Kusama finally broke up with her family and arrived in New York. She came to the right place at the right time: in a society absorbed in the study of psychedelic states, the artist, who interpreted such personal experiences, caused genuine interest. Moreover, a Japanese woman, especially a woman. Body art festivals, fashion shows, filming, demonstrations against the Vietnam War, Hepenings — Kusama plunged into the thick of artistic and social life. In the late 60s, Yayoi Kusama founded the company Kusama Fashion Company Ltd and opened a boutique selling clothes created according to her designs. 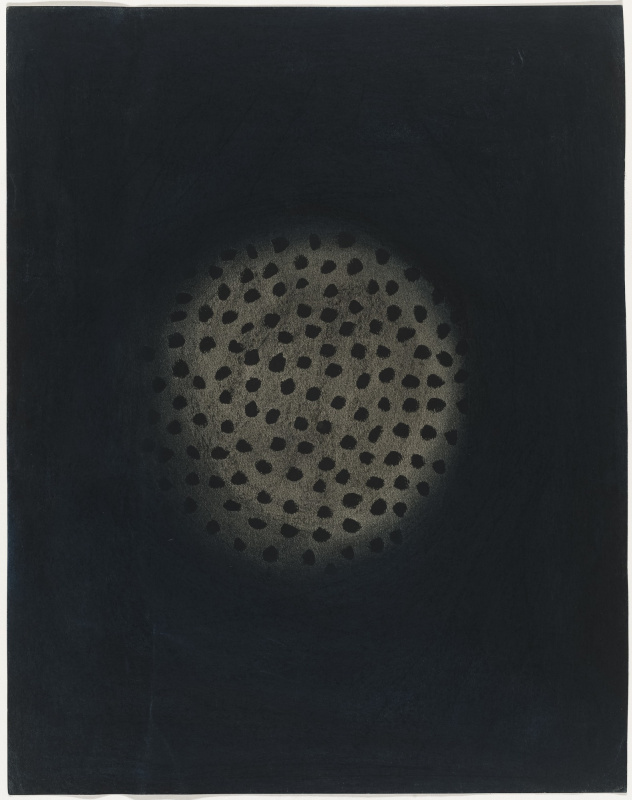 Art critic and famous American minimalist had a great influence on Kusama’s work. Donald Juddwhose articles made the artist famous (and with whom she had a fleeting affair). She was friends with Georgia O’Keefe, Eva Hesse, Andy Warhol, art historian Herbert Reed. Joseph Cornell Cusamu, a surrealist painter, was associated with tender platonic feelings: they painted each other, corresponded, and often called up Cornell’s death in 1972. His departure was a great trauma for Kusama. From painting, Kusama moves to sculpture and installations, overcoming internal fears, showing viewers their own obsessions. 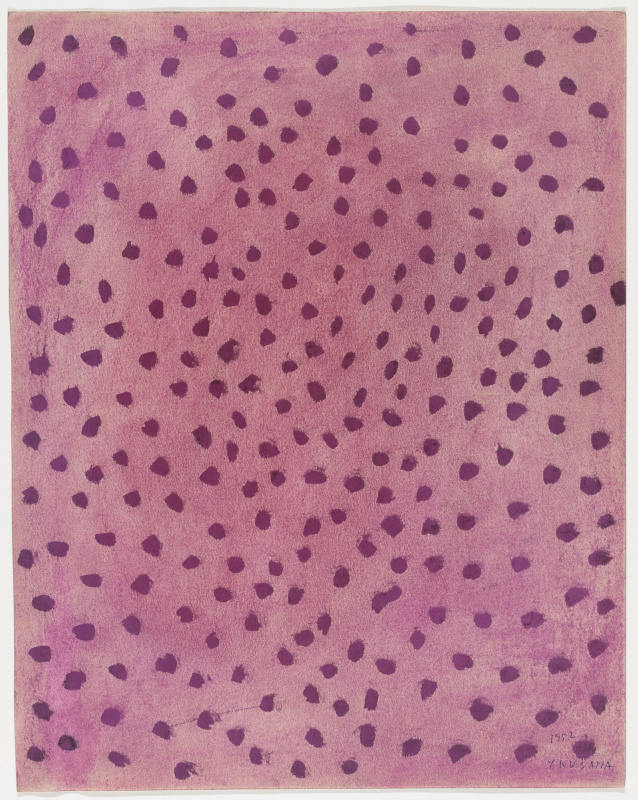 The famous pea pattern becomes recognizable, and Kusama gets the affectionate nickname "Dotty." In 1966, Kusamu was invited to take part in the Venice Biennale, where she presented the project "Garden of Daffodils" of a half thousand mirror balls. 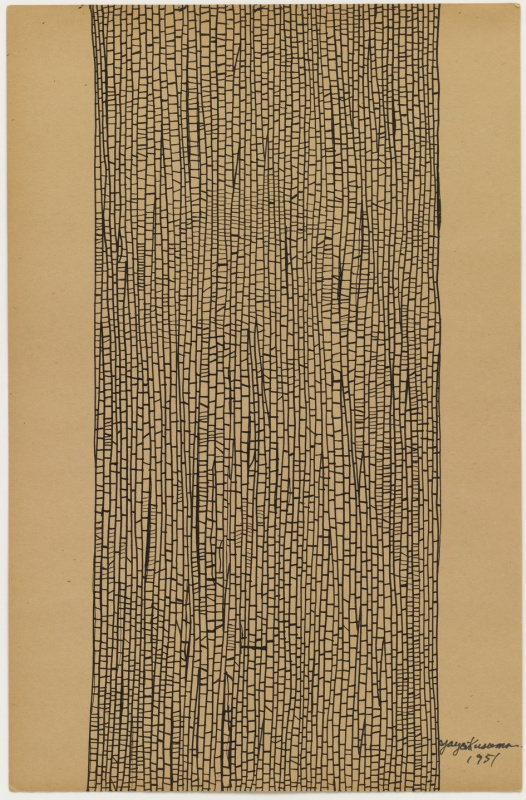 In 1968, Kusama’s Self-Obliteration, in which the artist starred, received several awards. Returning to Japan in 1973, the artist continued to create and display works of art, although her work was cool at home. In 1977, after a nervous breakdown, Yayoi Kusama decided to seek help at a Tokyo psychiatric clinic, where he resides to this day; her well-equipped studio is located in Shinjuku, two blocks from the clinic. Yayoi Kusama learned to live with her illness, and at the same time used all available opportunities to self-actualize in art. Kusama took up literary work, published a number of novels (known as Hastlers Street on Christopher Street) and literary collections. 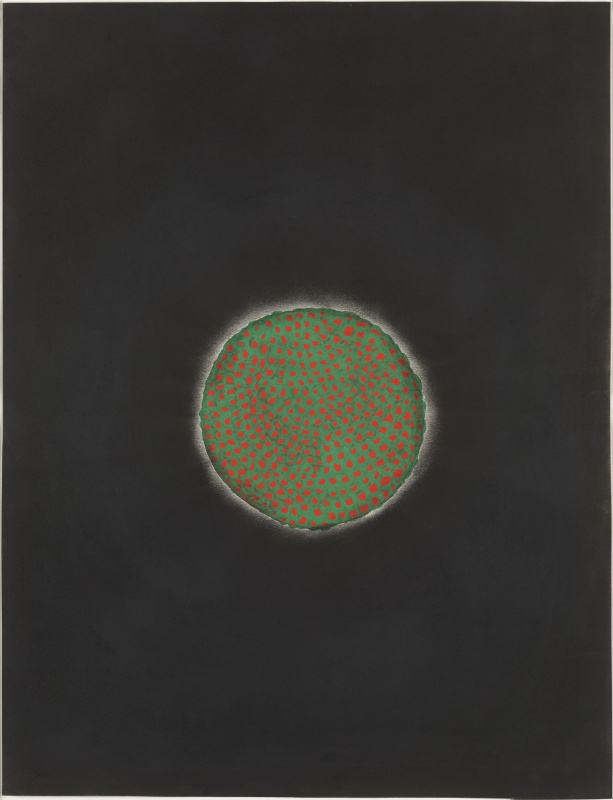 In the mid-80s, painting was again in the focus of the artist’s interests, and in her work another figurative element appeared — a pumpkin, and later — another "corporate" element — the eye. In 1993, Yayoi Kusama became the first female artist to present Japanese art in the country’s national pavilion at the Venice Biennale. In 2006, the artist became the first Japanese woman to be awarded the Imperial Prize in the field of painting, and on October 1, 2018 in Tokyo Yayoi Kusama Museum. Yayoi Kusama is the most expensive among contemporary artists: her painting "White No. 28" (1960) was sold at auction by Christie’s in 2014 for $ 7.3 million. Her exhibitions are grandiose events that attract millions of visitors around the world (expositions are visited in different countries), and "to get Kusamu" is the dream of any museum or gallery. 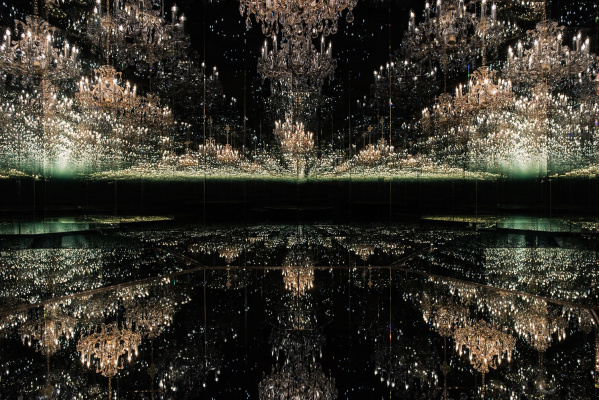 From relatively recent resonant events —Presentation of the song by the singer Adele in the "Infinite Mirror Room" — installations by Yaeey Kusama. As Yayoi herself says, "I struggle with pain and fear on a daily basis, and the only method that helps me cope with the disease is art." Yayoi Kusama (March 22, 1929, Matsumoto, Nagano Prefecture, Japan) - Japanese artist, writer and poetess, feminist, master of installation and performance. The most expensive of the living artists. 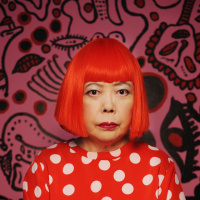 Features of the artist Yayoi Kusama: its famous “polka-dot” patterns have already become a brand — just like Yayoi who personifies him in a recognizable look: a bright wig, clothes made of fabrics with characteristic ornaments. Headlines about the artist rarely do without mentioning mental illness. Indeed, the peculiarities of the hallucinatory perception of the world caused by mental disorders formed the basis of Yayoi Kusama's work. It is based on the idea of repeating patterns - “networks of infinity” and spaces covered with peas and phallic symbols transformed into some coral reefs. Overcoming fears through the multiplication of objects is the “recipe” for the artist’s personal art therapy. Yayoi Kusama calls herself “an obsessive artist” and invites viewers to experience her personal perception of reality, to see the world as she sees it. Yayoi Kusama was born into a rich provincial family professing the traditional values characteristic of Japanese culture. At the age of ten, Yayoi had the first attack of hallucinations - the girl was looking at a flower tablecloth, and at some point she thought that the flowers began to spread to all surfaces of objects in the room, windows and walls. This childish impression of dissolving into infinity will subsequently repeatedly become one of the principles on which Kusama creates his installations. One more fear of sexuality, which Kusama developed in her younger years under the influence of the complex relations between her parents, the artist will subsequently multiply and reflect this factor as a kind of symbolism. On the recommendation of psychotherapists, Kusama begins to look for an opportunity to leave the family and leave Japan. As the artist later noted, by that time she began to consider Japanese society "too small, too slavish, too feudal, and too dismissive towards women." She writes to several famous artists, to whom she sends her watercolors, and receives an approving letter from Georgia O'Keefe. In 1957, Yayoi Kusama finally broke up with her family and arrived in New York. She came to the right place at the right time: in a society absorbed in the study of psychedelic states, the artist, who interpreted such personal experiences, caused genuine interest. Moreover, a Japanese woman, especially a woman. Body art festivals, fashion shows, filming, demonstrations against the Vietnam War, Hepenings - Kusama plunged into the thick of artistic and social life. In the late 60s, Yayoi Kusama founded the company Kusama Fashion Company Ltd and opened a boutique selling clothes created according to her designs. 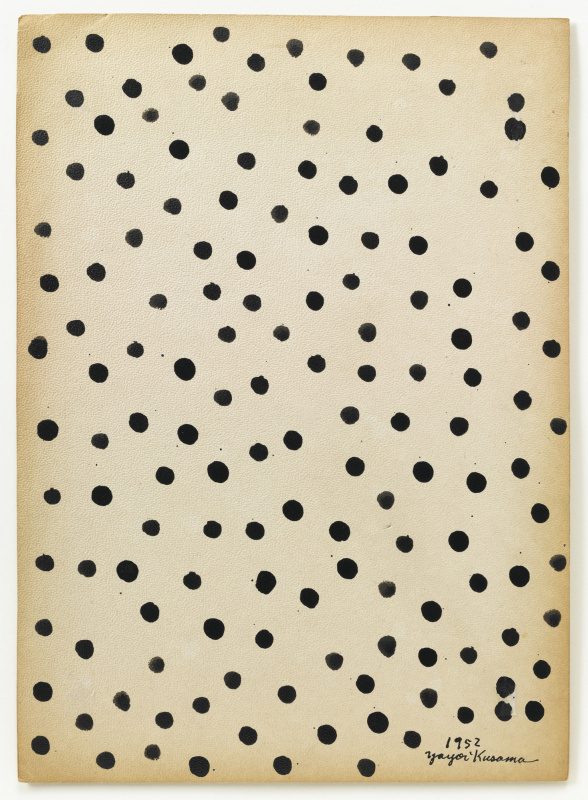 Art critic and famous American minimalist had a great influence on Kusama's work. Donald Juddwhose articles made the artist famous (and with whom she had a fleeting affair). She was friends with Georgia O'Keefe, Eva Hesse, Andy Warhol, art historian Herbert Reed. Joseph Cornell Cusamu, a surrealist painter, was associated with tender platonic feelings: they painted each other, corresponded, and often called up Cornell's death in 1972. His departure was a great trauma for Kusama. In 1966, Kusamu was invited to take part in the Venice Biennale, where she presented the project "Garden of Daffodils" of a half thousand mirror balls. 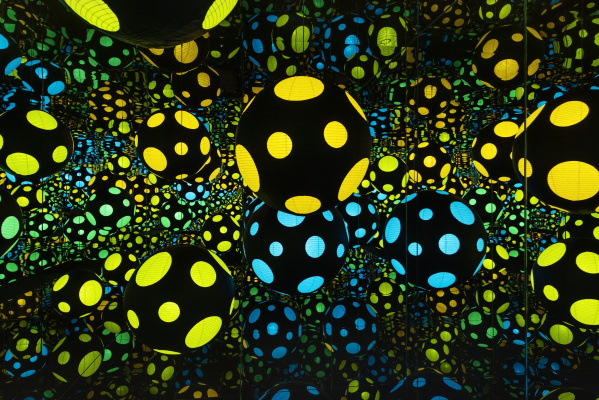 In 1968, Kusama's Self-Obliteration, in which the artist starred, received several awards. Kusama took up literary work, published a number of novels (known as Hastlers Street on Christopher Street) and literary collections. In the mid-80s, painting was again in the focus of the artist’s interests, and in her work another figurative element appeared - a pumpkin, and later - another “corporate” element - the eye. In 1993, Yayoi Kusama became the first female artist to present Japanese art in the country's national pavilion at the Venice Biennale. In 2006, the artist became the first Japanese woman to be awarded the Imperial Prize in the field of painting, and on October 1, 2018 in Tokyo Yayoi Kusama Museum. Yayoi Kusama is the most expensive among contemporary artists: her painting “White No. 28” (1960) was sold at auction by Christie's in 2014 for $ 7.3 million. Her exhibitions are grandiose events that attract millions of visitors around the world (expositions are visited in different countries), and “to get Kusamu” is the dream of any museum or gallery. From relatively recent resonant events -Presentation of the song by the singer Adele in the "Infinite Mirror Room" - installations by Yaeey Kusama. В 2018 году вышел документальный фильм о японской художнице Яёи Кусаме «Кусама. Бесконечные миры». Работа над лентой продолжалась более 10 лет, и теперь она доступна просмотра в сети. Даже короткий трейлер дает представление о завораживающем и гипнотическом путешествии через фантастические миры, которые создает одна из самых неординарных художниц современности.